Interferon, also abbreviated as IFN, is a group of signaling protein made and released by host cells in response to the presence of several viruses, named for their ability to "interfere" with viral replication by protecting cells from virus infections. Interferons belong to the large class of proteins known as cytokines, molecules used for communication between cells to trigger the protective defenses of the immune system that help eradicate pathogens. In a typical scenario, a virus-infected cell will release interferons causing nearby cells to heighten their anti-viral defenses. Based on the type of receptor through which they signal, human interferons have been classified into three major types, including type I IFN, type II IFN and type III IFN. Among of them, type I IFN and type II IFN are well-studied. 1. Type I interferon includes interferon α (which can be further divided into 13 different subtypes (IFN-α1, -α2, -α4, -α5, -α6, -α7, -α8, -α10, -α13, -α14, -α16, -α17 and -α21), β, ε, к, and ω in human. All type I IFNs bind an identical common cell-surface receptor, which is known as the type I IFN receptor. The receptor for type I interferons has multichain structures, which is composed of at least two different submits, IFNAR1 and IFNAR2. 2. Type II interferon, only including interferon gamma, also known as IFN γ, is a cytokine that is critical for innate and adaptive immunity against viral, some protozoal and bacterial infections. 3. Type III interferon includes interferon λ, which can be further divided into 4 distinct subtypes, IFNλ1, IFNλ2, IFNλ3 and IFNλ4 in human. For more information about interferon, please read the article, The Overview of Interferon. Interferon is an important class of CUSABIO cytokine proteins collection. As the table below shows, CUSABIO almost has all of interferons and receptors, and all of them are featured with biological activity and high purity. Additionally, they are in stock. Here are several SDS-PAGE images of some hot interferons for your reference. As mentioned in the paragraph 2, The IFN family is consist of three main classes of cytokines, type I IFNs, type II IFN and type III IFN. Currently, studies just revealed the mechanism of type I IFNs and type II IFN with signaling pathway. The receptors of type I interferon make up of IFNAR1 and IFNAR2. 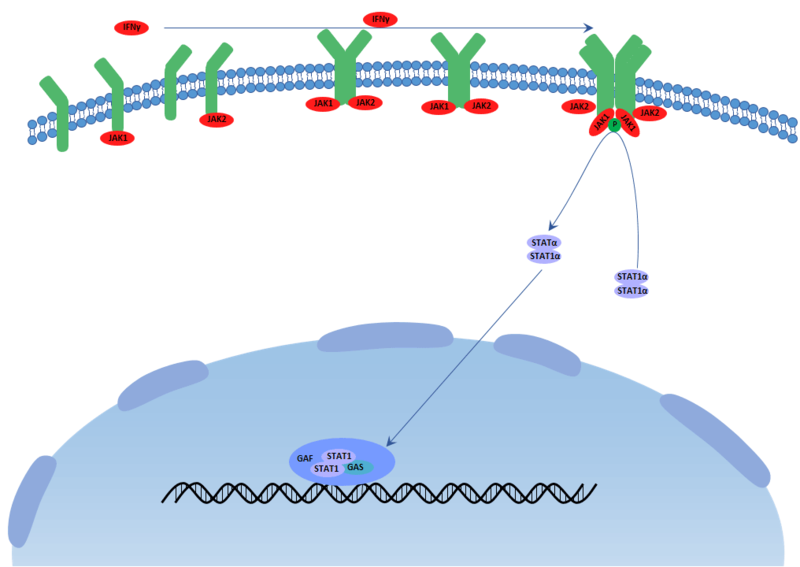 They stimulate the JAK-STAT pathway, resulting in the expression of IFN-stimulated genes (ISG), which are related to the antiviral host defense. An important transcriptional complex, induced by type I IFNs, is the ISG factor 3 (ISGF3) complex. The mature ISGF3 complex is consist of the phosphorylated STAT1 and STAT2, and combine with IRF9, which does not suffer tyrosine phosphorylation. This complex is the only complex that binds specific elements (known as IFN-stimulated response elements (ISREs)) that are present in the promoters of certain ISGs, then initiating their transcription. You can click here to refer the picture of type I IFN signaling pathway. Type II interferon (interferon gamma) is produced by activating T cells, natural killer cells and macrophages et al. upon the stimuli of cytokines like interleukin 12. The receptors of type II interferon make up of IFNGR1 and IFNGR2. The transcription of type II IFN (IFN γ)-dependent genes is regulated by GAS elements, and STAT1 is the most important IFN γ-activated transcription factor for the regulation of these transcriptional responses. After binding to the type II IFN receptor by IFN γ, JAK1 and JAK2 are activated and then phosphorylate STAT1 on the tyrosine residue. Then phosphorylated STAT1 combines with another and forms STAT1–STAT1 homodimers, which translocate to the nucleus and bind GAS elements to initiate transcription. 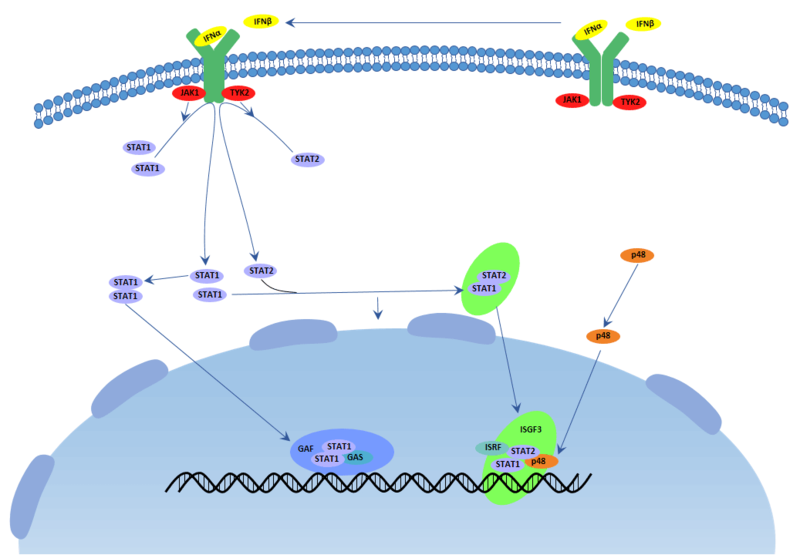 You can click here to refer the picture of type I IFN signaling pathway.